Today's gardeners often have fewer hours in the day to keep their garden in top condition. Therefore, architectural features are just as likely to be a key part of the design as planting in a modern garden. Indeed, few modern gardens are dominated by excessive amounts of planting nowadays. For a contemporary look, low maintenance options tend to be the choice of most gardeners. You can create a successful, modern-looking garden which still provides plenty of color and interest without you having to spend every weekend attending to back yard chores. When planning out a modern garden, consider the amount of time you will be able to dedicate to it. This might be lower than you expect, depending on your work and family commitments. Too much time spent weeding or dealing with spreading plants which start to dominate those around them can mean you come to think of your garden as a place that creates extra work, not pleasure. Opt for low maintenance choices as they require less work yet still provide a relaxing outdoor environment. Remember that the garden is for the whole family. If you live alone, then there is no one to please in your garden than yourself, so you can enjoy exploring all of your own horticultural tastes. If you have kids, on the other hand, then a play area or at least a portion of the garden that is laid to lawn will be something you want. Remember that low maintenance wood bark chips create a soft play area and that artificial grass is often just as good as the real thing for playing on. Ground cover is another key part of any garden. Plants like geraniums are great for providing ground cover in a bed and they often spread out of their own accord without you needing to intervene. However, you might consider ground cover options which rely on no planting at all. Patio paving slabs, pea shingle and decking are all popular options in a modern garden which provide totally maintenance-free ground cover. Create rooms or zones in a contemporary garden to give your home additional living areas which can increase the value of your property. If you deal with the back yard as a single outdoor space, then it can be a bit overwhelming, especially if the garden is large. Instead, cut down the space into rooms which have a distinct feel in each. Cut off areas with walkways, planters or even screening and fencing. This adds to your privacy but also means each zone has its own personality, especially when backed up by individual planting schemes. Irrigation is something that most American gardens need and to ensure that your garden remains verdant a regular supply of water is essential. 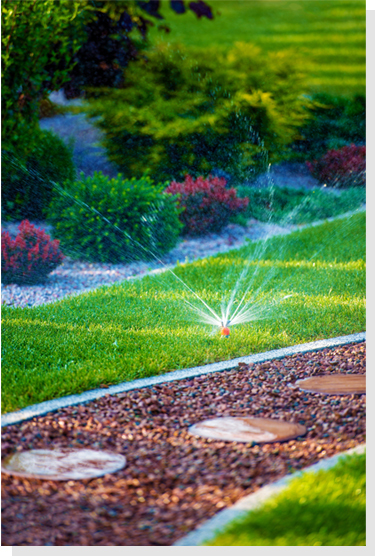 Nowadays, retro-fitted irrigation systems are easy to install for yourself. These systems are connected to the water supply and can then be regulated by a timer device to allow water to flow into the key areas of your garden, just when it is needed. Of course, some plants require more water than others, depending on the drainage available, so make sure you opt for a system that can be regulated at intervals along the pipes to provide more or less water in particular localities. A modular system will simply snap together so you can alter the way water flows to accommodate new layouts down the line. Planters are a great way of looking after a garden easily. Because they are raised up from the ground level, planting reaches eye level more rapidly, meaning you can often see your flowers more easily. They can also be moved around, so you can reconfigure your garden's design, if necessary, or shift delicate plants to less exposed areas. However, because they are filled with their own soil or compost, you should also find that you need to weed out unwanted growth much less often than a regular ground bed, saving both time and effort. If you want to have a garden which requires very little maintenance, then opt for paving throughout. Alternatively, go for shingle. Japanese style modern gardens are often laid out entirely with shingle and stones and can do away with planting all together. Patterns can be raked through the stones to create an attractive design. Even though this means careful work when the garden is first laid out, there is little to do afterwards in terms of maintenance. Just sit back and enjoy the serenity. When growing plants in your garden, you will need to ensure you have enough time and experience to keep them looking their best. Pruning and cutting back in fall along with weeding out new growth in spring can become tiresome. Instead, opt for maintenance-free plants which are hardy enough to get on with looking after themselves and which can survive a cold winter yet still offer an attractive display next year. Many perennials will provide the right balance between maintenance and attractiveness, such as ferns, amsonia, asters, coreopsis and geraniums. If you need help planning your garden talk to a landscaping professional.